Big Finish: Doctor Who - The Jago and Litefoot Revival, Act 1 Review | Warped Factor - Words in the Key of Geek. Tony settles in for a learned lecture. There’s something inherently joyful, and a little something inherently advertorial, about the Short Trip double-bill 7.03 and 7.04 from Big Finish – together, these two releases form a long short trip, an hour-long adventure with the company’s breakaway stars, Professor George Litefoot and Henry Gordon Jago. There’s no disguising the fact that they also star the Tenth Doctor, as conspicuously not played here by David Tennant, despite He of the Spikiest Quiff in The Cosmos having made his Doctorial debut in the sound booths last year. 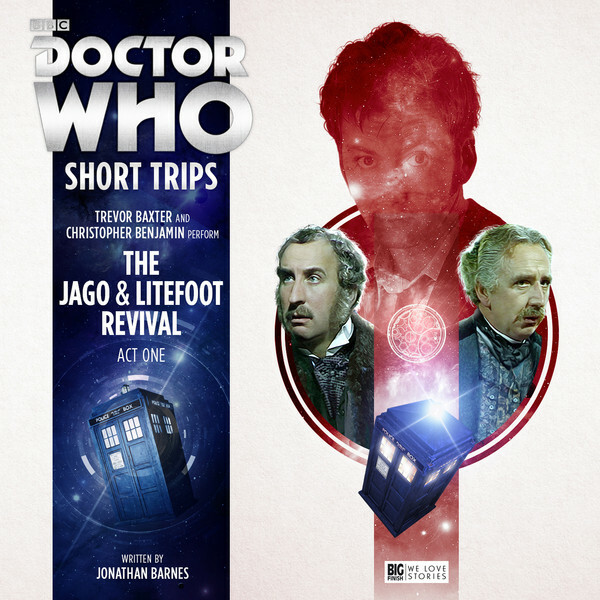 Quite apart from an opportunity for Victorian London’s finest to add to their Doctor-count though, The Jago & Litefoot Revival is a chance for Big Finish to show off at least something of how it intends to take the new series Doctors forward on audio, with or without the Doctor-actors’ direct participation. There’s an initial five minutes of what might, in the theatre, be charitably described as ‘business’ as Litefoot prepares to address one of Victorian London’s eminent societies for clever and curious gentlemen – and there are some lovely Easter egg references there – only to be interrupted by Jago blustering in. That leads to a handful of minutes that feels longer than it is, spent in simply legitimizing and explaining what Jago is doing there at all. That could really have been dealt with in a line or two, and arguably the audio would have been leaner for it, but fortunately, it’s all taken care of pre-credits, so once the Tenth Doctor’s theme music punches in, we’re off to the races with an adventure that sees Jago and Lightfoot in different countries, facing different villains, but more or less feeling the same sentiment – Jago & Litefoot is a tight unit, a magnet for the weird, the mysterious and the otherworldly, and after all these years of battling the bizarre together, they’ve become if not addicted, then certainly invigorated by their adventures, so that life without some eldritch attack or supernatural shenanigan begins to feel rather dull, the two investigators beginning to feel their actual age. As a way to combat such torpor, Litefoot takes up an offer from his old oppo, Jean Bazemore, to come and take look at her archaeological dig on the island of Minos (We bet she says that to all the boys. Or girls. Or non-binary folk. So…erm…everyone, really), while Jago tries to get on at home, attempting to re-inject the spirit of the golden age of music hall back into London’s veins. Christopher Benjamin and Trevor Baxter begin to each advance their own storyline, and the contrast between them is well drawn by writer Jonathan Barnes, and given their own individual colour by director Lisa Bowerman. Benjamin’s Jago has to deal with some bizarre and serious arachnid infestation issues at the New Regency theatre, calling in an exterminator to put down the web-spinning blighters that are colonising his basement (don’t in any way take that as a euphemism). As such, the tone is an insidious cold and foggy London, Jago seeming to feel almost exhausted by the whole business – the acts lining up for a shot at the limelight are fundamentally useless, his life lacks adventure, his friend has scooted off on the holiday of a lifetime if you like mouldy old bits of rock, and to cap it all, he’s got spiders in the basement, which is enough to give any chap a case of the oopazooticks. Meanwhile Litefoot, following a thoroughly boring sea crossing, and a reunion with Joan, finds himself still filled with ennui, thinking about writing his memoirs and feeling like an old man, but the tone of the audio is warmer, more indolent and tinged with hot-boned torpor. It’s Litefoot though who first advances boredom into adventure, finding an alien artefact and making almost reluctant use of it, while seemingly stalked by a mad-haired gentleman in a brown suit. There’s a clever division of storytelling labour at work here, as Litefoot’s threat is rather esoteric and otherworldly, a high-concept bit of weirdness with a highly arresting aesthetic that would be absolutely in keeping with modern Who. The raison d’etre of the villains is a little hokey, a little Tenth Doctor technogibber, and seems to suggest that at some point in life, everyone will have been visited by the implacable, impossible and creepy creatures that now threaten the Professor, but in terms of Something To Run Away From, they work very well in this setting, and when Litefoot finally meets up with the Man In The Long Brown Coat, you’ll be a hard-hearted Who-fan indeed if you don’t have a bit of a sniffle.